S I G N & D I G I T A L G R A P H I C S • August 2018 • 69 He and his team ask five questions before taking on any project: Will it be fun? Does the customer trust us? Do we have enough time? Will it bring us closer to work we want to do in the future? Is there enough money? "We only want to be known for work we want to do," he says. He appreciates the clients who give him free rein to be creative and have a decent budget for the project so he doesn't have to limit his imagination. He uses 30-lb. Precision Board or higher for all of the com- pany's projects, which is much denser than the industry standard of 15- to 20-lb. board. The big reason is that it is stronger than the lighter weight high-density urethane. The company puts a tremendous amount of work into its pieces. Sawatzky says lighter weight HDU is so fragile, it would crumble under the amount of detail that he and his team put into each piece. Most of the company's cutting is done on a 3-axis MultiCam router, which "allows us to work quickly and with higher preci- sion, and that's important," he says. Most of his competitors use the machine and hand work to make a project look like it was done by machine. Sawatzky wants his work that comes off the router to look like it was done by hand. "We purposely add texture so it looks hand done. That adds tremendous value in today's world. I work very quickly, but the router will do it five times faster. It will do all of the grunt work so it allows us to put in the hand work afterwards," he says. Imagination Corporation paints all projects by hand and also does sculpting with sculpting epoxy when necessary. Metal pieces were integrated into the carved signs. The leafy bracket was plasma cut steel and the structure of it goes into the actual sign as well as the mounting plates on the wall. 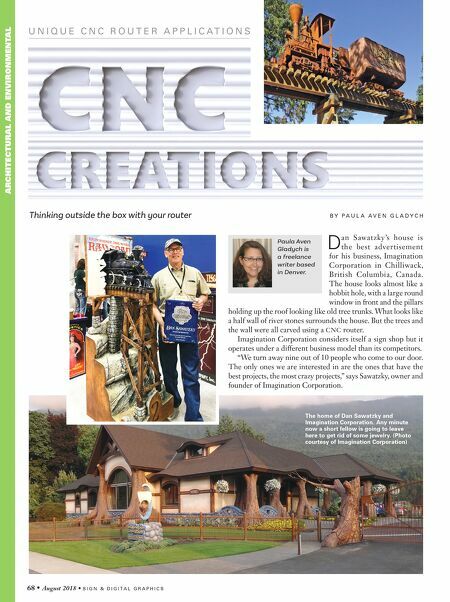 (Photo courtesy of Imagination Corporation) It uses its CNC plasma to incorporate brackets into its designs. "Everything tells the story, from the brackets all in. We are storytellers. Everything we do we put a story to it and tell that story visually," he says. 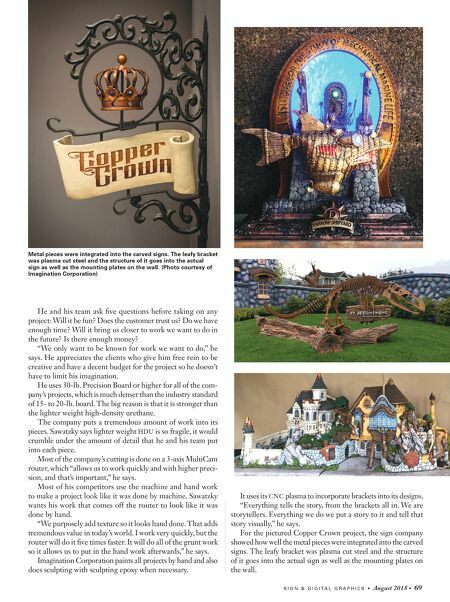 For the pictured Copper Crown project, the sign company showed how well the metal pieces were integrated into the carved signs. The leafy bracket was plasma cut steel and the structure of it goes into the actual sign as well as the mounting plates on the wall.